The 4th round of the championship took the guise of the 12hr marathon at Daytona Milton Keynes. 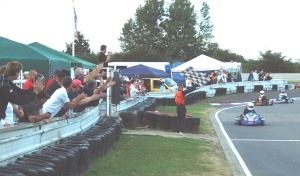 Qualifying was held on the Saturday night with the race from 9am-9pm on the Sunday in the most glorious of conditions. Team Zaremba took the pole from Team X with TKR Racing and Teamtec making up the 2nd row. After a 'night on the town' for many of the teams, Zaremba headed the roll-up lap on Sunday morning and the massive grid was now under way. Within the first hour, at least half a dozen teams had pitted, having lost chains probably due to excessive use of the kerbs. Team X and Zaremba had eked out a small gap from TRK Racing, followed by Teamtec, Kartoon and Lakeside. Fabcar then moved into the top six before pitting with a fuel problems and Zaremba left Team X with the lead as they refuelled after just 45 minutes. After the first round of fuel stops, Team X led from Teamtec with Kartoon, TKR, Misfits and Lakeside all still on the same lap. At the 3½-hour mark, a red flag brought proceedings to a stop and after the restart; Team X still led Teamtec from Kartoon, Eau Rouge and TKR. Kartoon then moved up to 2nd place before a split fuel tank necessitated a lengthy pit stop dropping them down to midfield. This moved Teamtec up to 2nd and Zaremba back up to 3rd from Eau Rouge and Team Velocity making up the top six places. With half distance now completed, Team Velocity then incurred a fuel problem elevating Misfits up to 3rd and Gas'n'Go and Lakeside up into the top six. As the race entered its 8th hour, Team X were extending their lead and barring any mechanical failure, were looking uncatchable. Eau Rouge who had worked their way up to 4th place, then lost a clutch dropping them back to 12th, allowing Gas'n'Go up to 4th followed by Misfits and then Chatburn Challengers up into the top ten for the first time. 3rd place Zaremba, collected a tyre wall and subsequently bent an axle putting them completely out of contention, minutes later 2nd place Teamtec had a coming together with Teamtec Juniors, dropping the senior team out of the top ten. This now left Team X a country mile in front of Misfits and Gas'n'Go, with TKR in 4th from Chatburn and Lakeside with three hours racing remaining. TKR then came in under weight consequently losing 10 laps and Gas'n'Go lost their brakes rejoining in 9th place, leaving Misfits in 2nd from Lakeside, Chatburn, Teamtec, Auctionmyigloo and Teamtec Juniors. 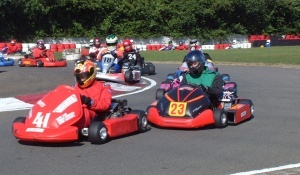 The throttle cable then failed on the Teamtec Junior kart putting paid to their top six finish, relinquishing that place to Gas'n'Go, whilst Team X moved relentlessly towards victory. With the chequered flag in sight, Team X cruised home to victory, with Misfits and Lakeside taking the remaining podium places and an excellent 4th place overall for Chatburn Challengers, who also claimed the top clubman prize.